« Holidays Eating is Over. Whew! Happy New Year! Body Shaming! Actresses’ character in fat suit has her jaw wired shut, loses weight, is now “hot” and plots revenge on those who fat-shamed her by competing in beauty pageants. What? Are we back in 1980? Just when I think we’re finally making some progress, at least in some arenas, something comes along that proves body shaming is still alive and thriving in the Entertainment Industry! In way of full disclosure, I have not yet seen any of the episodes of the soon to be released Netflix series INSATIABLE (August 10th) , but I have seen the trailer! Like most of my colleagues, I have great concerns about the negative impact of what appears to be the series’ fat shaming message. What do you think? • It reinforces this horrible rule that those at higher weights can only be acceptable and attractive and worthy of being noticed when at a socially acceptable weight. NO. My fellow humans at higher weights already are worthy. BECAUSE THEY ARE ALREADY HUMANS. • It reinforces that women/girls/femmes are hysterical if angry. Anger is NORMAL when oppressed. This is gas lighting victims to make them perceive interpretations as self-inflicted or nonexistent. • It glorifies a form of starvation as a do-able, achievable, noble, HEALTHY way to empower and energize yourself. Eliminating calories is literally the opposite way to energize our bodies. Starvation is the opposite of what our body needs no matter our size. • It reinforces that SIZE over HEALTH is paramount. • It reinforces that weight loss is a behavior. NEWS FLASH: it is not. 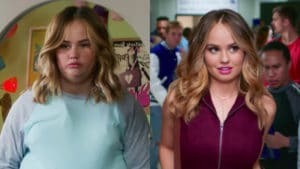 As I write this blog post, a Change.org petition to “Stop the Release of Netflix’s Body-Shaming series ‘Insatiable’ ” has received close to 122,000 signatures and climbing rapidly…in just 4 days. This issue of body judgement, a TV series not even released yet, is getting lots of media attention! The troops are rallying! YES! If interested in reading about the petition and deciding if you, too, would like to be heard, Click Here. Have you seen the AMC Series Dietland? It, too, is about revenge for women who are marginalized by their looks, but takes on this challenge in a much different way…to say the least. As of this writing, I have only seen the two episodes (Episodes 1 & 2 are free to watch online until July 31st, 2018 and the entire series can be purchased on Amazon Prime Video). I like what I see, so far! When I watch the rest, I’ll write another post. If you have seen it, let us know what you think. Check out my other posts about the entertainment industry’s bad behavior when it comes to weight-ism; body, fat, and size shaming.